Pseudomonas aeruginosa is an opportunistic pathogen that forms biofilms on tissues and other surfaces. We characterized the interaction of purified human neutrophils with P. aeruginosa, growing in biofilms, with regard to morphology, oxygen consumption, phagocytosis, and degranulation. Scanning electron and confocal laser microscopy indicated that the neutrophils retained a round, unpolarized, unstimulated morphology when exposed to P. aeruginosa PAO1 biofilms. However, transmission electron microscopy demonstrated that neutrophils, although rounded on their dorsal side, were phagocytically active with moderate membrane rearrangement on their bacteria-adjacent surfaces. The settled neutrophils lacked pseudopodia, were impaired in motility, and were enveloped by a cloud of planktonic bacteria released from the biofilms. The oxygen consumption of the biofilm/neutrophil system increased 6- and 8-fold over that of the biofilm alone or unstimulated neutrophils in suspension, respectively. H2O2 accumulation was transient, reaching a maximal measured value of 1 μM. Following contact, stimulated degranulation was 20–40% (myeloperoxidase, β-glucuronidase) and 40–80% (lactoferrin) of maximal when compared with formylmethionylleucylphenylalanine plus cytochalasin B stimulation. In summary, after neutrophils settle on P. aeruginosa biofilms, they become phagocytically engorged, partially degranulated, immobilized, and rounded. The settling also causes an increase in oxygen consumption of the system, apparently resulting from a combination of a bacterial respiration and escape response and the neutrophil respiratory burst but with little increase in the soluble concentration of H2O2. Thus, host defense becomes compromised as biofilm bacteria escape while neutrophils remain immobilized with a diminished oxidative potential. Pseudomonas aeruginosa is an important causative agent of a variety of acute and chronic infections, including burn wound infections as well as infections of the respiratory tract, urinary tract, eye, and ear (1). P. aeruginosa is also well adapted to the hospital environment because of its nutritional versatility, minimal growth requirements, and extensive acquisition of antibiotic resistances (2), and therefore causes nosocomial infection on indwelling devices such as catheters used in continuous ambulatory peritoneal dialysis and in the urinary tract. In patients with cystic fibrosis (CF), 3 chronic pulmonary infections with alginate-producing strains of P. aeruginosa are the leading cause of morbidity and mortality (reviewed in Ref.3). A common characteristic of P. aeruginosa infections is that they are caused by bacterial association with surfaces, either human tissue or indwelling device, and therefore may be considered biofilm-associated diseases (4). It has been proposed that the quorum-sensing compounds, such as homoserine lactones, play an important role in the formation of bacterial biofilms (5, 6). Since P. aeruginosa in pulmonary infections secrete quorum-sensing compounds (6), infection of the CF pulmonary tissue has also been considered a biofilm-associated disease. Bacteria growing in biofilms often display a variety of phenotypic differences from the same strains growing in planktonic culture. These differences include changes in motility (7, 8), in some cases increases in the production of extracellular polysaccharides (9), and increased resistance to antibiotics (reviewed in Ref.10). Recent studies using DNA microarray analysis revealed differences in the expression of 73 genes of P. aeruginosa following 5 days of biofilm growth (11). Whole cell proteome analysis revealed as much as a 50% change in protein profiles following attachment of P. aeruginosa to a surface and development into a mature biofilm (12). Whether these phenotypic changes following biofilm formation are responsible for the increased resistance of P. aeruginosa to host defenses has not been determined. It is apparent that host responses are often not effective against biofilms. For example, indwelling devices must be removed following colonization by P. aeruginosa and cannot be effectively treated with antibiotics. In CF pulmonary infections, the thick mucus in the pulmonary tissue consists of a combination of bacteria, alginate that they secrete, as well as inflammatory cells attempting to clear the infection (3). Moreover, P. aeruginosa biofilms appear to be resistant to toxic oxygen products such as H2O2, easily converting it back to O2 with powerful catalase and superoxide dismutase activities (13, 14, 15). Neutrophils are probably the most significant component of the host defense mounted in the P. aeruginosa infection of the lung and it is clear that their significant secretory and phagocytic arsenal of toxic oxygen species, degrading enzymes, defensins, and lipid inflammatory mediators is often ineffective in combating such infections. In fact, neutrophils contribute to the pathology of lung disorders with these mediators (16) and provide a source of the DNA and actin polymers that contribute to the CF lung mucus and its characteristic congestive viscosity (17, 18). Neutrophils also constitute the major leukocyte presence in the blood and acutely inflamed tissue and would be expected to respond to growth of biofilms on surfaces implanted in the vasculature or other tissues. Thus, it would be important to understand how this host defensive system interacts with biofilms under controlled conditions. To examine the unique interaction of neutrophils with P. aeruginosa, we exposed biofilms of P. aeruginosa to neutrophils under conditions where the oxygen consumption, cell morphology, and host defensive processes could be monitored. We observed that the consumption of oxygen increases in both the bacteria and neutrophils, but with little accumulation of H2O2, when the leukocytes were allowed to settle on the biofilm. In addition, we found that the host defensive cells did not exhibit significant motility or the characteristic polarized morphology of motile cells, but were able to engage in phagocytosis while retaining a roughly spherical shape with modest membrane ruffling. The bacteria, on the other hand, appeared to exhibit an increased oxygen consumption and a phobotactic or escape response that released a cloud of bacteria that eventually enveloped and obscured the settled neutrophils. P. aeruginosa PAO1 was used in these studies and was routinely maintained on L agar (10 g tryptone, 5 g yeast extract, 5 g NaCl, 15 g Bactoagar/L; Difco, Franklin Lakes, NJ). For visualization of the bacteria using scanning confocal laser microscopy (SCLM), P. aeruginosa PAO1 contained plasmid pMF230 (19), which results in constitutive expression of the green fluorescent protein gfp-mut2. P. aeruginosa (pMF230) was maintained on L agar with 300 μg/ml carbenicillin (Anatrace, Maumee, OH). Human neutrophils were purified from fresh whole citrated blood using gelatin sedimentation as previously described by Henson and Oades (20). Isolated cells were stored on wet ice, (0°C) in modified HBSS (Sigma-Aldrich, St. Louis, MO) at ∼107–108 cells/ml until needed. Immediately before experiments, cells were resuspended and aliquoted to microfuge tubes and warmed to 37°C. Human serum was prepared by allowing fresh whole blood to clot at room temperature in sterile glass tubes. After clot retraction, the serum was pulled from the clot tube, placed in sterile microfuge tubes, and spun at a relative centrifugal force of 5000 × g for 2 min to remove any excess cells and clot debris. The supernatant was transferred via pipette to sterile microfuge tubes and stored at 4°C. For analysis of biofilm-neutrophil interactions by SCLM, a drip flow reactor with a glass microscope slide substratum was used to cultivate biofilms (21). The medium for the flow system (Biofilm medium) contained per liter: 0.09 mM sodium glutamate, 0.5 mM glycerol, 0.02 mM MgSO4, 0.15 mM NaH2PO4, 0.34 mM K2HPO4, and 145 mM NaCl. The pH of the medium was adjusted to 7.0. Flow cells were inoculated by first growing the cultures in 10× biofilm medium but only 15 mM NaCl until the cell density was ∼107 cell/ml. The cultures were diluted 10-fold in saline, and 5 ml of cell suspension was used to inoculate the flow cells. After 20 min, the flow of 1× biofilm medium was initiated at a rate of 1.2 ml/min, and biofilms were cultivated at 37°C for 72 h. After 72 h of cultivation, the microscope slides containing biofilms were removed from the chamber and placed in Petri dishes with HBSS, rinsed once, and then covered with 15 ml of HBSS. Neutrophils (2 × 107) were then stained in HBSS containing 16 μM of the vital stain BODIPY-FL SSE (sulfosuccinimidyl ester; Molecular Probes, Eugene OR) for 5 min, washed twice with HBSS, and resuspended in 200 μl of HBSS. Stained neutrophils (50 μl) were then added as a drop to the center of the biofilm slide and regions with an appropriate neutrophil density were chosen visually in the neutrophil settled area (∼10- to 15-mm diameter). Experiments comparing myeloperoxidase release by neutrophils induced by 1 μM formylmethionyleucylphenylalanine (fMLF) in the presence of 10 μM cytochalasin B showed there was no detectable difference in the magnitude or kinetics of the degranulation in BODIPY-stained and unstained neutrophils, suggesting that neutrophils were not affected by the stain or staining procedure (data not shown). For experiments with nonrespiring bacteria, the biofilms were treated for 30 min with 0.02% sodium azide, then washed twice with HBSS. In fixed cell experiments, the neutrophils were treated with fresh cold 2% paraformaldehyde for 5 min, then washed twice with HBSS. The bacteria and neutrophils were observed using a Leica TCS-SP confocal microscope (Leica Microsystems, Heidelberg, Germany) with a ×63 water immersion objective. For bacterial observation, the GFP was excited with the 488-nm line of an argon laser and emission was collected at 500–550 nm, and for neutrophil visualization, the BODIPY-FL was excited with the 568-nm line of a krypton laser and emission was monitored at 590–700 nm. Confocal stacks were collected on the same field over a time period of 80 min. Images were processed using the shadow projection function of Imaris 3.0 (Bitplane, St. Paul, MN) and Adobe Photoshop (Adobe Systems, San Jose, CA). For analysis of oxygen profiles using calibrated microelectrodes, biofilms were cultivated in a flat-plate open-channel Bioreactor with glass microscope slides serving as the biofilm substratum (22). Biofilms were washed twice daily for 20 min with sterile water to remove excess cell debris and planktonic microorganisms. Before the addition of neutrophils, the reactors were rinsed with sterile water and equilibrated in HBSS at 37°C in polycarbonate chambers. HBSS (6 ml) was added to the neutrophil stock suspensions to give a final concentration of 107 cells/ml. Neutrophils were incubated with the biofilm for 30 min. In experiments involving biofilm serum exposure, the biofilms were incubated with 10% autologous serum in the incubation buffer for 30 min before adding neutrophils or conducting oxygen determinations. Dissolved oxygen measurements were performed with a modified Clarks-type electrode with guard cathode as previously described (23). The measurements were directed to a computer-based data acquisition system that monitored the current and the position of the microelectrode. Measurements were made at 17-μm vertical distance intervals starting in the buffer above the biofilms until the substrate base of the biofilms. An inverted microscope (Olympus, Tokyo, Japan) was used to locate microelectrode tips during biofilm measurements. Oxygen fluxes were calculated from the slopes of the oxygen concentration gradients according to the method of Villaverde et al. (24). The experiments were reproduced for nine different biofilm/neutrophil preparations. Data shown in Fig. 5⇓ are from a representative set of measurements on the same biofilm/neutrophil system. Hydrogen peroxide measurements were performed with a glass-encased platinum wire anode against a silver/silver chloride reference electrode from Fischer Scientific (Tustin, CA) as previously described (25). The anode was polarized with a constant potential of +0.80V. The hydrogen peroxide electrode was calibrated using standardized 30% hydrogen peroxide solutions diluted into HBSS. P. aeruginosa biofilms were grown in reactors as described above. The biofilms were then incubated in HBSS for 30 min in the presence or absence of 10% human serum obtained from autologous donors of neutrophil preparations. Neutrophils were added to the buffer above the biofilms to a cell density of 107 cells/ml and allowed to settle for 30 min at 37°C. The samples were fixed by placing the slides in 10% PBS containing 2% glutaraldehyde and 8% sucrose. The samples were rinsed twice with 15-min incubations in PBS (pH 7.4) and incrementally dehydrated in a series of washes in 50, 70, 90, and 100% ethanol for 10 min each. The samples were then transferred to brass containers for critical point drying with ethanol and CO2. Following critical point drying, the samples were mounted on scanning electron microscopic stages with double-stick carbon tape and sputter coated with 20 nm of gold-palladium in the presence of argon. The samples were examined using a JEOL 6100 scanning electron microscope (JEOL USA, Peabody MA) with a Runco digital imaging system (Runco International, Union City, CA). For transmission electron microscopy, similarly treated samples were fixed in 3% glutaraldehyde, stained in 2% OsO4 in 0.1 M potassium/sodium PBS (pH 7.2), and then rinsed three times. Following rinsing, the samples were dehydrated sequentially in 50, 70, 90, and 100% ethanol. Dehydration was followed by rinsing and embedding in Spurr’s resin. The blocks were then sectioned into 70-nm sections using a RMC MTXL ultramicrotome (Boeckler Instruments, Tuscon, AZ) and examined using a Hitachi H-7100 electron microscope (Hitachi High Technologies America, Pleasanton, CA) equipped with an AMT digital camera system coupled with a 1K by 1K charge-coupled device camera (Advanced Microscopy Techniques, Danvers, MA). For assays of free myeloperoxidase, β-glucuronidase, and lactoferrin released by neutrophils, P. aeruginosa biofilms were grown in 96-well microtiter plates and exposed to neutrophils. Supernatants of extracellular medium were examined for content of the above constituents of primary and secondary granules. Overnight bacterial cultures were diluted 1/100 in 10× biofilm medium (but containing only 145 mM NaCl) and used to inoculate plates. To allow biofilm formation, cultures were grown for 48 h at 37°C, with the medium changed with sterile medium every 8 h, to provide fresh medium and to remove planktonic cells. The medium was changed 1 h before the introduction of the neutrophils. In some experiments, the biofilms were rinsed in HBSS once followed by a 30-min preincubation with HBSS or HBSS plus 10% autologous serum at room temperature. Immediately before the introduction of the neutrophils, the biofilms were rinsed three times in HBSS. Visible biofilms were observed as a white film in the wells and by using a phase-contrast inverted microscope. HBSS was added to each well (the final volume for each experiment was 200 μl). Some experiments were performed by adding 10 μM cytochalasin B and 1 μM fMLF to the wells to provide a measure of maximum granule release. Human neutrophils, 4 × 105/well, were added and incubated for 45 min at 25 or 4°C. The plates were shaken sufficiently every 10 min to mix the suspension. At the end of the incubation, the plates were centrifuged at 140 × g of the relative centrifugal force for 5 min to pellet the neutrophils. A 50- to 70-μl aliquot of the supernatant was placed into a new plate before and after the 25°C incubation and maintained on ice until assay for granule protein content could be performed. In preliminary experiments, the biofilm/neutrophil system supernatants were sampled for granule release every 15 min for up to 90 min. Maximal release was achieved after 15–30 min for all conditions. The myeloperoxidase content of the supernatants was measured colorimetrically, scaled to a microtiter plate assay (200 μl) according to Parkos et al. (26). β-Glucuronidase activity was measured colorimetrically after scaling to microtiter plate volumes (200 μl) according to Fishman (27). Lactoferrin was assayed by quantitative Western blot analysis (28) using pure human milk lactoferrin (Sigma-Aldrich) as a standard and Cappel rabbit anti-human lactoferrin (1/8000 dilution for chemiluminescence, 1/1000 dilution for conventional analysis; ICN Biomedicals, Irvine, CA) for the primary Ab and peroxidase-conjugated or alkaline phosphatase-conjugated goat anti-rabbit (H + L) for chemiluminescence or colorimetric immunoblot assays (Bio-Rad, Hercules, CA) as a secondary Ab. Western blots were developed as described by Pierce using the commercially available Pierce chemiluminescence assay kit (Pierce, Rockford, IL) or the 5-bromo-4-chloro-3-indolyl phosphate/nitroblue tetrazolium Phosphatase Substrate System (Kirkegaard & Perry Laboratories, Gaithersburg, MD). Specifically, immunoreactive bands on developed x-ray film were quantitated by densitometry using ImageQuant software (Molecular Dyanmics, Sunnyvale, CA). Immunoblots developed with colorimetric methods were similarly scanned using an image scanner to create TIFF files, which were also quantitated using ImageQuant software. Lactoferrin content of unstimulated neutrophils in mock wells was determined both in diisopropyl fluorophosphate-treated and untreated cells and found to be 2.9 ± 0.1 and 2.6 ± 0.2, respectively. The maximum amount released, in the presence of secretagogues fMLF and cytochalasin B was 82 ± 12%. Since most of the lactoferrin release studies were performed on cells that were not treated with the protease inhibitors, release values varied significantly. Proteolytic activity was observed as immunoreactive bands of molecular mass lower than ∼80 kDa. The errors reported are SEs with n = 16. To examine the interaction between human neutrophils and P. aerugniosa biofilms, neutrophils were isolated and purified from peripheral blood and labeled with the vital fluorescent stain BODIPY-FL SSE as described in Materials and Methods. These red fluorescent cells were allowed to settle on biofilms of green fluorescent protein-expressing P. aeruginosa grown on glass surfaces using a drip flow reactor. This labeling scheme allowed clear demarcation of both types of cells by two-color fluorescence confocal microscopy. Fig. 1⇓A shows that when a neutrophil settles on an area of the slide that is free of biofilm it typically exhibits a characteristic “fried egg” morphology observed during tight adherence and “frustrated phagocytosis” (29, 30). This morphology shows that the stained neutrophils were viable, responsive, and able to undergo significant remodeling of their cytoskeleton in response to the untreated surface. In contrast, neutrophils exposed for up to 45 min to the P. aeruginosa biofilms do not exhibit any significant polarization or irregular gross morphology characteristic of stimulation or frustrated phagocytosis. The neutrophils retained a round, fairly symmetrical morphology viewed either from above or from a confocal reconstructed transverse section through the biofilm. The “dorsal” surface appeared relatively round, yet the “ventral” or biofilm contact surface of the neutrophils, although still primarily rounded, appeared to contain bacteria that either were engulfed or enveloped by the neutrophil. Settling of BODIPY-labeled human neutrophils onto sterile glass (A) or onto P. aeruginosa PAO1 (pMF230) biofilm (B). P. aeruginosa constitutively expressed gfp-mut2 for visualization using the SCLM. The top view (upper) and confocal reconstructed transverse section (lower) are shown. Scale is as indicated. To confirm independently, at higher resolution, that neutrophils indeed retained this rounded morphology after settling on P. aeruginosa biofilms, the interactions were also examined by scanning electron microscopy using biofilms grown slightly differently (under conditions where oxygen metabolism could also be monitored), under laminar flow conditions in a channel bioreactor operated isothermally (see Materials and Methods). The biofilms were incubated with 10% autologous serum or control HBSS solution, covered by a suspension of neutrophils at 107 cells/ml, then glutaraldehyde-fixed for scanning electron microscopy. Fig. 2⇓A shows the morphology of the P. aeruginosa biofilm without the addition of neutrophils, revealing a characteristic heterogeneous distribution of cell aggregates and clusters spaced between channels penetrating into the biofilm. This morphology was indistinguishable from that observed after exposure to 10% autologous serum (Fig. 2⇓B), although higher magnification revealed a greater abundance of fine filamentous fimbriae-like structures with serum addition (data not shown). When neutrophils were added, they completely covered the biofilm, turning it white upon visual inspection. After 30 min of incubation, the leukocytes can be seen integrating into the complex surface and lining the cavities of the biofilm. Fig. 2⇓, C and E, show the association of leukocytes in the absence of serum, and Fig. 2⇓, D and F, show the interactions in the presence of 10% autologous serum. In some cases, the neutrophils were partially covered and obscured by the biofilms. However, almost without exception they retained a highly symmetrical, rounded morphology with modest ruffling (Fig. 2⇓, E and F). This morphology is reminiscent of unstimulated cells rather than cells exposed to opsonized surfaces with potentially high concentrations of chemoattractants (31). No evidence of frustrated phagocytosis (29, 30, 32) or polarized motility (33) was observed, although numerous examples of bacterial adherence to the surface of the neutrophils were seen (Fig. 2⇓, C–F). This morphology was apparent whether or not the biofilms were pretreated with 10% autologous serum. Scanning electron microscopy of neutrophil-P. aeruginosa PAO1 biofilm interactions. 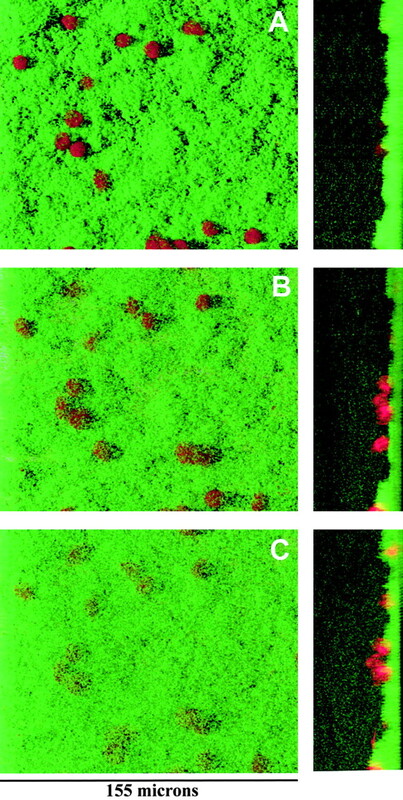 A, C, and E, Serum-free biofilms. B, D, and F, Biofilms opsonized with autologous human serum. A and B, Low magnification of P. aeruginosa biofilms in the absence of added neutrophils. C and D, Low magnification of P. aeruginosa biofilms following interaction with human neutrophils after 30 min of exposure. 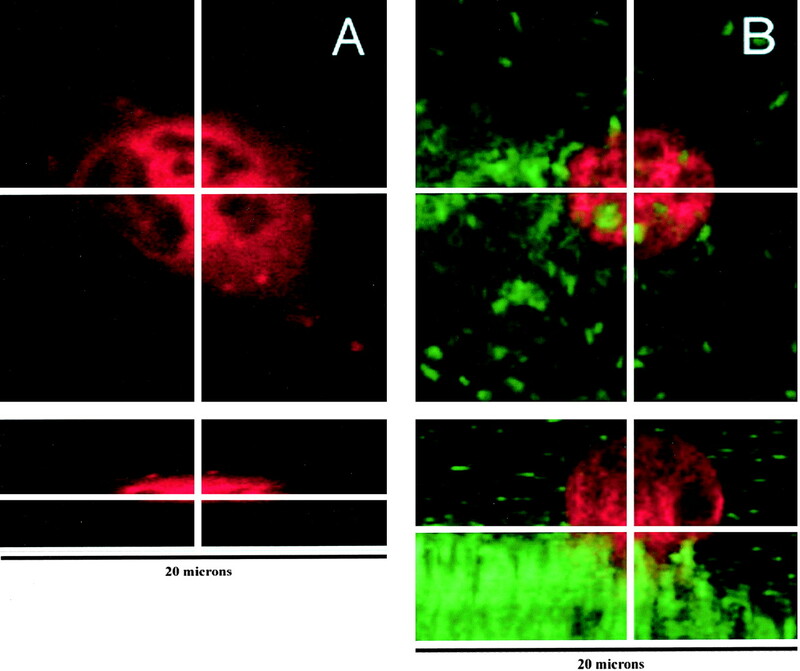 E and F, Higher magnifications of biofilm/neutrophil interactions showing the round morphology of the neutrophils in the presence and absence of serum. Scale is as indicated. Because neutrophil morphology changes relatively quickly (within 5 min of exposure to stimulants at room temperature), time courses of the settling of viable BODIPY-labeled neutrophils on P. aeruginosa biofilms were examined by SCLM. Fig. 3⇓ shows a series of confocal microscopic images taken during a 60-min exposure of neutrophils to serum-exposed biofilms. After settling (Fig. 3⇓, A and B), the round neutrophils do not move or change shape significantly but appear to slowly sink into the biofilm until they are fully covered by a very smooth biofilm surface (Fig. 3⇓C). Examination of a vertical or transverse confocal section of the system shows that the neutrophils do not actually migrate into the surface, but instead remain immobile and attached to a relatively stable biofilm interface. Interestingly, a cloud of bacteria that gets increasingly dense with time forms above the more substantial biofilm interface (Fig. 4⇓, A and B). This cloud progressively obscures the view of the neutrophils from above, giving the impression that they are somehow burrowing into the biofilm. This type of activity is also observed to be slightly more rapid when biofilms are pre-exposed to 10% autologous serum and also occurs upon exposure of the biofilm to serum alone (data not shown). Treatment of the biofilms with 0.2% NaN3, to inhibit respiration, before addition of the neutrophils prevented the cloud formation (Fig. 4⇓, E and F) and the pseudo sinking of the neutrophils into the biofilms (data not shown). Treatment of either the biofilm or the neutrophils separately with 2% paraformaldehyde also prevented biofilm mobilization (data not shown), indicating that the bacteria respond only to the viable neutrophils. Time course of settling of neutrophil on P. aeruginosa PAO1 (pMF230) biofilms. A, Five minutes following neutrophil addition, B, 15 min, and C, 60 min. The confocal transverse sections projections are shown in adjacent panels. Scale is as indicated. SCLM transverse sections showing effect of serum and azide treatment on neutrophil settling and biofilm motility. A and B, Serum-free biofilms following 15 and 45 min of exposure to neutrophils. C and D, Biofilms exposed to serum and neutrophils for 15 and 45 min. E and F, Azide-treated biofilm exposed to neutrophils for 15 and 45 min. Scale is as indicated. From the lower resolution and noninvasive methods of examination, it appears that the biofilm bacteria become mobile upon exposure to purified neutrophils, serum, or both, while neutrophils exhibit a distinct nonreactive morphology. To examine more closely the leukocyte-biofilm interaction, we also determined the oxygen requirements of the system. Neutrophils engage in strong oxidative bursts that can generate on the order of 10 fmol/min-cell superoxide. These bursts can generate local steady-state concentrations of superoxide or H2O2 of 1–10 μM around a single neutrophil (34). To examine the oxygen requirements of the biofilm-neutrophil system, the concentration-driven fluxes of oxygen into the biofilm were calculated by measuring the dissolved oxygen concentration gradients along the vertical axis from the biofilm substratum to the buffer above using a modified Clark-type microelectrode (35). Fig. 5⇓A shows an example of the microelectrode measurements of oxygen concentration as a function of depth into a paraformaldehyde-fixed biofilm. Initially, the O2 concentration is constant throughout the biofilm and is equal to the ambient oxygen concentration, since the fixed bacteria do not respire. The concentration profile observed for living biofilms is very different and is shown in Fig. 5⇓C. In living biofilms, [O2] drops to near zero in the biofilm due to the aerobic metabolism of its bacterial members (13, 22). Following addition of the neutrophils to the fixed biofilm in Fig. 5⇓A, the O2 concentration is rapidly reduced in the biofilm as well as above it as the neutrophils utilize the O2 for minimal basal metabolism and for NADPH oxidase to generate superoxide. At later times as the respiratory burst subsides, the concentration gradient relaxes, reflecting a return of higher oxygen concentrations in the biofilm as O2 concentration re-equilibrates by diffusion-driven processes. Oxygen metabolism of the biofilm-neutrophil system. Human neutrophils were added to P. aeruginosa PAO1 living (C–F) or paraformaldehyde-fixed (A and B) biofilms in the presence (E and F) or absence (A–D) of serum, and the dissolved oxygen concentrations (A, C, and E) were measured as a function of distance from the biofilm substratum interface to the oxygen electrode tip. Oxygen consumption rates (B, D, and F) were calculated from the spatial dissolved oxygen concentration gradients (A, C, and E) measured at the indicated time. A, The dissolved O2 concentration gradients across a paraformaldehyde-fixed biofilm before (○) and 15 min (♦) or 60 min (□) after addition of neutrophils. B, The calculated flux (consumption rate per unit area) into the paraformaldehyde-fixed biofilm alone (t = 0) or after the indicated interval of time following the addition of neutrophils. C, The oxygen concentration gradients across a living unopsonized biofilm before (○) and 5 min (▴) or 15 min (♦) after addition of neutrophils. D, The calculated flux (consumption rate per unit area) into the biofilm alone (t = 0) or after the indicated interval of time after the addition of neutrophils. E, The oxygen concentration gradients across a living unopsonized biofilm before (▪) and 5 min (▴) after addition of serum or after 30 min of serum exposure followed by 5 min of exposure to neutrophils (▾). F, The calculated flux (consumption rate per unit area) into the biofilm alone (t = 0) or after the indicated interval of time after the addition of neutrophils. Experiments were repeated nine times. The data shown are from one typical data set. Such gradients were measured at several time points before and after addition of neutrophils and the diffusion-driven fluxes of oxygen into the biofilm were calculated by the method of Villaverde et al. (24). The fluxes are shown in Fig. 5⇑B for the paraformaldehyde-fixed biofilm. 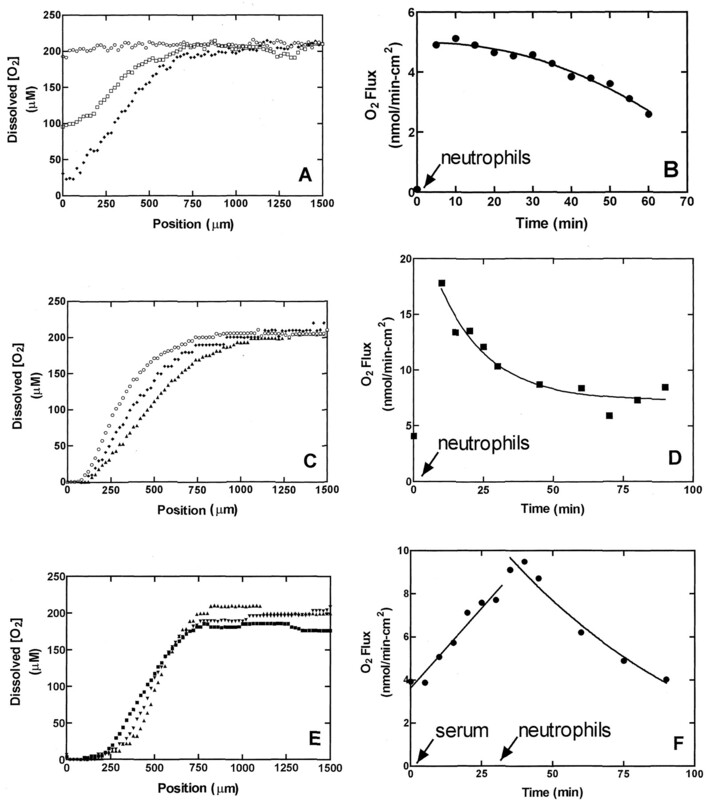 These fluxes directly reflect the neutrophil oxygen consumption rates per unit area of the biofilm and clearly show that oxygen consumption is stimulated by the settling of neutrophils onto the biofilm surface (see Discussion). It is evident that neutrophil addition to fixed biofilms resulted in a sudden jump of O2 flux from near 0 to 5 nmol/min-cm2, followed by a gradual, accelerating decline to approximately half that value by 60 min. Since the neutrophil surface density in the experiment is ∼3.2 × 106 cells/cm2, this maximum flux value corresponds to an O2 consumption rate of ∼17 nmol/min-107 cells, a value that is eight times the resting consumption rate of resting neutrophils in suspension and ∼17% of the maximal rate observed during an oxidative burst, in such cells, induced by saturating concentrations of stimulants such as PMA and the combination of fMLF plus cytochalasin B (26). Fig. 5⇑, C and D, shows the O2 concentrations and fluxes, respectively, following addition of neutrophils to an untreated (unopsonized) living P. aeruginosa biofilm and were derived in the same way as Fig. 5⇑, A and B. In this system, the O2 concentration gradient is already established by the living biofilm at time 0. Oxygen flux (i.e., O2 consumption) into the biofilm thus reflects the respiration of the living bacteria in the biofilm only. However, upon addition of neutrophils, the gradients get steeper and the O2 consumption rate increases ∼5-fold from a steady-state level of 4 nmol/min-cm2 before neutrophil addition to 18 nmol/min-cm2 upon settling of neutrophils. With time, the O2 consumption gradually declines back to twice the initial steady state by 90 min. An analogous experiment was also performed to evaluate the effect of serum on the biofilm-neutrophil system. Addition of serum alone to the P. aeruginosa biofilms also steepens the oxygen concentration gradients shown in Fig. 5⇑E and thus induces an increased oxidative requirement shown in Fig. 5⇑F, linearly pushing fluxes from 4 to ∼8–10 nmol/min-cm2 in 30 min. Addition of neutrophils to this system temporarily increases the oxygen flux further but then causes reversal of the increasing trend. This reversal reflects a gradual decrease in oxygen consumption to levels equivalent to those observed before the addition of neutrophils or serum. In parallel studies, we also measured the concentration profiles of H2O2 produced by neutrophils settled onto biofilms. This production resulted in a transient, steady-state H2O2 concentrations of 1–2 μM or less at the biofilm interface (data not shown). Together, these experiments indicate that the oxygen requirements of the biofilm-neutrophil systems increase between 2- and 5-fold over the oxygen requirement for biofilm alone in the absence or presence of serum, respectively. For neutrophils on the paraformaldehyde-fixed biofilm, oxygen consumption results only from the net contribution of neutrophils since the biofilm consumed no oxygen by itself. Additionally, since very little H2O2 can be measured in the living biofilm-neutrophil system, these results also suggest that the biofilm may contribute to its rapid consumption (see Discussion). To determine whether other host defensive activities of neutrophils are affected by the encounter with P. aeruginosa biofilms, stimulated degranulation of neutrophils was determined. Biofilms were grown in microtiter plates, and the release into the medium of azurophil granule proteins, myeloperoxidase and β-glucuronidase, and the specific granule component, lactoferrin was assayed after biofilm exposure to neutrophils. Fig. 6⇓A shows that when neutrophils are exposed to biofilms in the absence of serum, myeloperoxidase is released into the extracellular medium to a level that is ∼20% of the maximal release observed when a known degranulating stimulus or secretagogue (36, 37) is used, such as 1 μM fMLF in the presence of 10 μM cytochalasin B. This release was >5-fold greater than that observed for neutrophils adhering to plastic. In the presence of serum-opsonized bacteria, however, significantly greater amounts of myeloperoxidase (∼40%) were released to the medium. Exposure of the neutrophils to control plastic surfaces after coating of the wells with 10% serum also resulted in an approximate doubling of the respective myeloperoxidase release. Myeloperoxidase release was paralleled by the release of another primary granule constituent, β-glucuronidase. Although the assay was less sensitive to the release of this granule enzyme, β-glucuronidase amounts in the extracellular medium paralleled the amount of myeloperoxidase released (data not shown), confirming the degranulation activity. Biofilm-induced neutrophil myeloperoxidase and lactoferrin release. Neutrophils were layered onto static biofilms grown in microtiter plates or onto sterile plastic control wells. After 60 min, the extracellular medium was assayed for released myeloperoxidase (A) and lactoferrin (B) as described in Materials and Methods. Biofilms or microtiter plate wells were exposed to 10% autologous serum before neutrophil addition. To measure maximum release, the assay was also conducted in the presence and absence of the secretagogue combination 1 μM fMLF plus 10 μM cytochalasin B (CB). A, Bar graph shows the myeloperoxidase release as a percentage of the maximum observed in the presence of cytochalasin B plus fMLF. Dark bars indicate biofilm in the well to which the neutrophils were added. Light bars indicate no biofilm (plastic) in the corresponding well under the indicated conditions, i.e., unopsonized biofilm or bare plastic (No Addition); 10% autologous serum-opsonized biofilm or coated plastic well (Serum); unopsonized biofilm or bare plastic well in the presence of 1 μM fMLF plus 10 μM cytochalasin B (fMLF/CB); 10% autologous serum-opsonized biofilm or coated plastic well in the presence of 1 μM fMLF plus 10 μM cytochalasin B (Serum + fMLF/CB). Values are percentage of maximum ± SEM, n = 5. Maximum activity was chosen as the largest release observed for a particular experimental run with secretagogue added to the assay. B, Lactoferrin released into the extracellular medium of the degranulation assay. Conditions for shading are identical to that in A. Extracellular medium was assayed for the presence of a lactoferrin by quantitative immunoblot analysis. Maximum release was ∼0.9 ± 0.1 μg lactoferrin/well. Lactoferrin, a constituent of another granule population of neutrophils, the specific granules, has been shown to prevent formation of P. aeruginosa biofilms by enhancing motility of adherent bacteria (38). In our experiments, lactoferrin was also released by the neutrophils after exposure to serum-opsonized and unopsonized biofilms. The maximum amount of lactoferrin released by 4 × 105 neutrophils into the 200-μl assay was 0.9 ± 0.1 μg. Fig. 6⇑B shows the relative release of lactoferrin to the extracellular medium. The percentages shown reflect the release observed when compared with that seen with the maximally stimulated neutrophils (1 μM fMLF and 10 μM cytochalasin B) in contact with opsonized biofilms or serum-coated plastic control surfaces. (Each gave maximum (100%) readings in different experimental runs.) 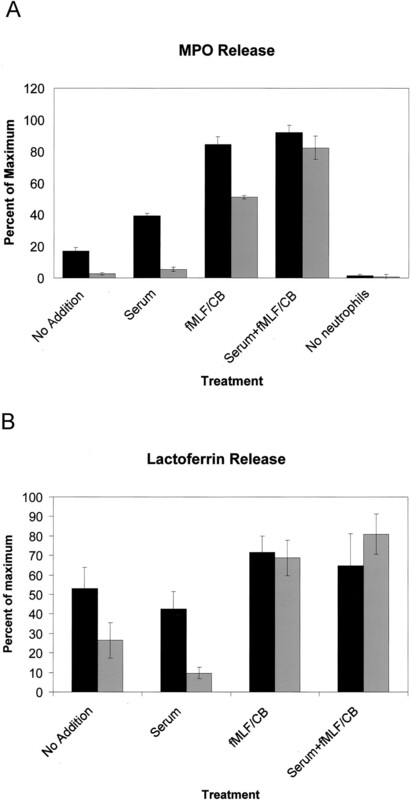 Lactoferrin release was determined by quantitative Western blot analysis of immunoreactive protein species recognized by an anti-lactoferrin Ab using human milk lactoferrin as a standard. It shows that the amount released is equivalent to ∼50 (no serum exposure) to 80% (with serum exposure) of the maximum observed with the secretagogue fMLF plus cytochalasin B stimulation. Although neutrophils do not appear to migrate into biofilms by an active process similar to ameboid crawling, they are capable of responding with an oxidative burst (although mitigated by biofilm respiratory competition for oxygen and by catalase activity (13)) and release primary and secondary granule constituents in the presence of biofilms. Ultimately, the crucial host defensive process that characterizes neutrophil function and their ability to kill microbes is phagocytosis. Neither scanning electron microscopy nor SCLM were able to provide unambiguous evidence that the neutrophils engaging the biofilms were involved in a phagocytic process. To assess whether the neutrophils contacting biofilm bacteria actually were engulfing bacteria and involved in their characteristic response, neutrophil-exposed biofilms were examined by transmission electron microscopy of transverse sections of biofilms exposed to neutrophils (Fig. 7⇓). Neutrophils are adherent to biofilms both in the absence (Fig. 7⇓A) and in the presence (Fig. 7⇓C) of serum. In both cases, there is direct evidence that neutrophils, with a primarily rounded morphology, exhibit significant phagocytic activity for biofilm bacteria on their bacteria adjacent surfaces. It also appears that the cells have developed mild asymmetry with more of the cell body extending to contact the surface bacteria (Fig. 7⇓B). Cells treated with cytochalasin B and fMLF are granule depleted but contain no phagocytosed bacteria (Fig. 7⇓D). Thus, active phagocytosis with a modest degree of polarity suggests that the neutrophils are able to respond to P. aeruginosa biofilms with a vigorous phagocytic response. P. aeruginosa in biofilms are engulfed by human neutrophils in the presence or absence of 10% autologous serum. A, Neutrophils shown settled onto serum-free P. aeruginosa biofilm. Dimension of lower edge is 40 μm. B, Higher magnification of neutrophils on a serum-free biofilm, actively engaged in phagocytosis. Dimension of lower edge is 13 μm. C, Neutrophils shown settled onto serum-exposed P. aeruginosa PAO1 biofilm. Dimension of lower edge is 40 μm. D, Neutrophils shown settled onto serum-free P. aeruginosa biofilm in the presence of 1 μM fMLF plus 5 μg/ml cytochalasin B. Dimension of lower edge is 49 μm. Our results show that a unique interaction occurs between P. aeruginosa PAO1 biofilms and human neutrophils in a model system. The results suggest that neutrophils settle onto biofilms but do not appear capable of migrating away from the point of contact even though they appear to mount a respiratory burst, degranulate, and engage in phagocytosis of biofilm bacteria. Neutrophil contact with P. aeruginosa PAO1 biofilms also stimulates “emigration” or “flight” of significant numbers of individual members of the biofilm community that may contribute to the increased respiratory activity of the system. Several lines of microscopic evidence suggest that normal migratory behavior of phagocytes is disrupted by P. aeruginosa PAO1 biofilms. Both SCLM and scanning electron microscopy (using unstained neutrophils), as well as phase-contrast microscopy using unstained neutrophils (data not shown), indicate that the neutrophils retain a rounded morphology, more characteristic of unstimulated cells, even though there are potentially very high concentrations of neutrophil chemotactic molecules in these biofilms. Such high concentrations of bacteria generally stimulate a highly polarized morphology in suspension cells and a high degree of random motility when neutrophils are attached to a variety of surfaces. Initially, we thought the biofilm had a cytochalasin B type of effect on the neutrophils, keeping them round and incapable of assembling actin. However, transmission electron microscopy indicated that, unlike in the cytochalasin B plus fMLF-exposed neutrophils, biofilm bacteria were engulfed by the rounded neutrophils. The mechanism by which the biofilms cause the neutrophils to become immobilized but still capable of phagocytosing bacteria is not known. However, exotoxins produced by P. aeruginosa may play a role. The P. aeruginosa exotoxins ExoS and ExoT are injected into eukaryotic cells by the type III secretion machinery (39). ExoT is a rho GTPase accelerator protein that affects actin polymerization of epithelial cells by inhibiting the stimulating activity of the GTP-bound form (40, 41). Such inhibition could have selective effects on cytoskeletal remodeling (42) and thus might be functionally similar but more specific than a global actin polymerization inhibitor such as cytochalasin B. This speculation will require additional investigation. The SCLM images suggest that the neutrophils observed in our study, unlike the leukocytes settled onto Staphylococcus aureus biofilms (43), do not “bore” into the biofilm. Instead, the neutrophils disturb the P. aeruginosa biofilm so planktonic members escape to the region above the biofilm surface. In the S. aureus study, the leukocytes also retained a round morphology but they exhibited a halo of clearance in the vicinity of leukocyte surface. It may be possible that such cells also manifested an escape motility response, albeit significantly reduced compared with the more actively motile P. aeruginosa bacteria. In our system, metabolic inactivation of the biofilms with NaN3 or of the neutrophils with paraformaldehyde prevents the “escape” response. Thus, the process appears to require bacterial and neutrophil metabolic activity. Superoxide dismutase and catalase added to the system to scavenge superoxide and hydrogen peroxide also appear to have no visible effect (data not shown) and suggest that these oxygen species do not function in signaling the process, as has been recently suggested for other eukaryotic systems (44). Pure lactoferrin has recently been shown to inhibit formation of P. aeruginosa biofilms without inducing the dispersal of established biofilms (38). In those studies, inhibition of biofilm formation was observed at 20 μg/ml lactoferrin. The secretagogue combination used in the positive control of our study causes neutrophils to maximally release ∼82% ± 12% of their granule contents (45) or 2.4 ± 0.3 μg/106 cells. Thus, our measurements suggest that biofilms induce neutrophils to release ∼50–80% of this maximal amount or ∼1–2 μg. The reported lactoferrin content of neutrophils is 5–25 pg/cell (46). Our measured lactoferrin contents are at the lower end of the reported range by a factor of two but the difference may not be significant considering the different assays used (47), the method of cell preparation, the broad range of lactoferrin content observed in the neutrophils of different donors (46), and the protease sensitivity of lactoferrin (48). Thus, we estimate that lactoferrin release is roughly 1–2 μg/106 cells on biofilms and thus may be capable of producing estimated local concentrations of lactoferrin in the range of 10–20 μg/ml in our confocal experiments. One additional caveat in this estimate, however, is the significant amounts of neutrophil proteases that are released during degranulation and phagocytosis (49). The neutrophils used in this study were not treated to prevent proteolysis and proteolysis was in fact observed as lower molecular mass fragments in immunoblot analysis of lactoferrin (data not shown). Thus, a significant fraction of lactoferrin released by the settling neutrophils is probably degraded. Singh et al. (38), in previous studies, showed that intact lactoferrin at similar concentrations inhibits P. aeruginosa biofilm development, stimulates postdivision motility, but fails to alter the structure of mature biofilms. We conclude that formation of the bacterial clouds on mature biofilms observed after neutrophil settling appears to be a significantly different response. However, because of the difference in time frames of published studies and our experiments, we cannot rule out lactoferrin or its degradation products as being responsible for the stimulated bacterial motility we observed. Although the polarization and migration of neutrophils appears to be disrupted by biofilm contact, the neutrophils retain phagocytic and secretory activity. Neutrophil exposure to paraformaldehyde-fixed biofilms induces significant O2 consumption that is probably activated by neutrophil/bacterial contact. Jensen et al. (50) have shown, in an analogous living biofilm setting, that P. aeruginosa does indeed induce an oxidative response of shortened duration and magnitude in neutrophils when compared with equivalent planktonic interactions. Confirmation of the neutrophil contribution to oxygen consumption when settled onto unfixed biofilms was provided by direct measurement of H2O2 concentration profiles at the neutrophil-biofilm interface. 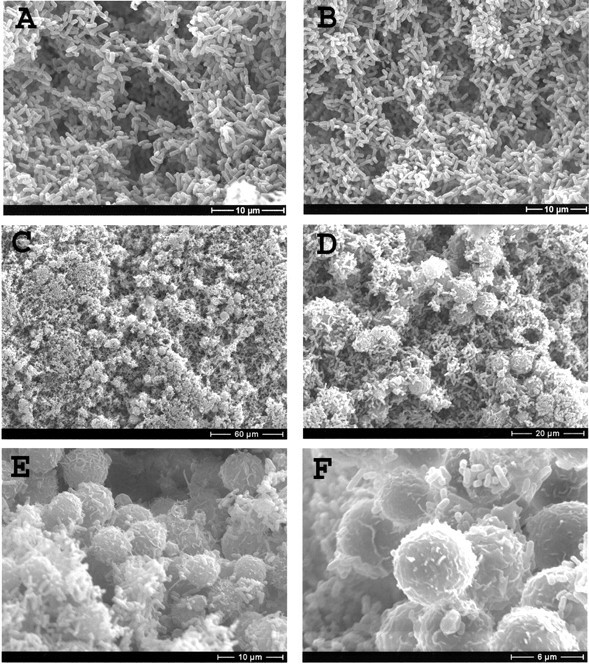 This production resulted in transient maximal H2O2 concentrations of 1–2 μM at the biofilm liquid interface containing an estimated 3 × 106 cells/cm2. Neutrophils in suspension (∼106/ml) are capable of producing steady-state concentrations of H2O2 of ∼10 μM from the superoxide that their NADPH oxidase generates (51). H2O2 production can be efficiently converted back to oxygen by bacterial catalase which can be used by bacterial biofilms for respiration (13). It also can be used for host defensive function by free (51) or bacterial-bound (52) myeloperoxidase released by neutrophils. Indeed, studies of the neutrophil oxidative burst activated by suspensions of Escherichia coli have established that a competition for oxygen exists between the host defensive cells and bacteria (53). Thus, the effect of the neutrophil oxidative burst on the bacteria will depend on 1) the relative amount of H2O2 recycled to oxygen and used for respiration by bacterial catalase and respiratory systems; 2) the amount converted to HOCl by the bound/locally deposited myeloperoxidase; and 3) the amount entering into the neutrophil cytoplasm and destroyed by the glutathione peroxidase system (54). Nevertheless, because the neutrophils are immobilized on the biofilm, the bacteria effectively form a protective wall that may serve as a sink for O2, H2O2, O2⨪, and myeloperoxidase products and continuously supply catalase-recycled oxygen to both types of uninjured cells. In an infection, as masses of neutrophils pile up on this wall, the net effect may be to expose the neutrophils to their own oxidants, resulting in self-injury and thus compromising their own host defensive activity (55, 56) while uninjured bacteria escape to colonize elsewhere. Therefore, such activity benefits the biofilm membership with replenishment of neutrophil-depleted oxygen needed for bacterial metabolism and mitigation of oxidative damage. The results also suggest that a major fraction of the net demand or “sink” for oxygen is the increased metabolic activity of the biofilm bacteria observed when stimulated either with serum alone, which contains the microbicidal complement system as well as bacterial nutrients, or with the secreted neutrophil products. Together our observations suggest that the structure, biochemical makeup, and response of the P. aeruginosa biofilm bacteria to a massive influx of neutrophils acts to mitigate the leukocyte host defensive function. Such behavior might contribute to the ineffectiveness of these host defensive cells in the pathologic environment of the cystic fibrosis lung or other biofilm infections. We thank Gary Jackson for his help in growing biofilms and Jeannie Gripentrog for her expertise in preparing neutrophils. Special thanks go to Jim Burritt, Chuck Parkos, and Brad Britigan for their insightful comments and criticisms. We also thank the Center for Computational Biology for use of the Leica confocal microscope, Nancy Equal of the Image and Chemical Analysis Laboratory, and Andy Blixt of the Veterinary Molecular Biology Laboratory for help with scanning electron microscopy. Transmission electron microscopy was conducted by Roy Pescador at the University of Montana Electron Microscopy Facility and the Montana Network for Biomedical Research Opportunities. ↵1 This work was supported by Public Health Service Grants RO1-AI 22735 (to A.J.J. ), RO1 AI 26711 (to A.J.J. ), AI-46588 (to M.J.F), and 1PZORR16455 (to University of Montana Microscopy Facility). ↵3 Abbreviations used in this paper: CF, cystic fibrosis; SCLM, scanning confocal laser microscopy; fMLF, formylmethionylleucylphenylalanine. Cross, A., J. R. Allen, J. Burke, G. Ducel, A. Harris, J. John, D. Johnson, M. Lew, B. MacMillan, P. Meers, et al 1983. Nosocomial infections due to Pseudomonas aeruginosa: review of recent trends. Rev. Infect. Dis. 5:(Suppl. 5):S837. Cross, A. S.. 1985. Evolving epidemiology of Pseudomonas aeruginosa infections. Eur. J. Clin. Microbiol. 4:156. Lyczak, J. B., C. L. Cannon, G. B. Pier. 2002. Lung infections associated with cystic fibrosis. Clin. Microbiol. Rev. 15:194. Costerton, J. W., K. J. Cheng, G. G. Geesey, T. I. Ladd, J. C. Nickel, M. Dasgupta, T. J. Marrie. 1987. Bacterial biofilms in nature and disease. Annu. Rev. Microbiol. 41:435. Davies, D. G., M. R. Parsek, J. P. Pearson, B. H. Iglewski, J. W. Costerton, E. P. Greenberg. 1998. The involvement of cell-to-cell signals in the development of a bacterial. Science 280:295. Singh, P. K., A. L. Schaefer, M. R. Parsek, T. O. Moninger, M. J. Welsh, E. P. Greenberg. 2000. Quorum-sensing signals indicate that cystic fibrosis lungs are infected. Nature 407:762. Sauer, K., A. K. Camper. 2001. Characterization of phenotypic changes in Pseudomonas putida in response. J. Bacteriol. 183:6579. O’Toole, G. A., R. Kolter. 1998. Flagellar and twitching motility are necessary for Pseudomonas aeruginosa. Mol. Microbiol. 30:295. Davies, D. G., G. G. Geesey. 1995. Regulation of the alginate biosynthesis gene algC in Pseudomonas. Appl. Environ. Microbiol. 61:860. Stewart, P. S., J. W. Costerton. 2001. Antibiotic resistance of bacteria in biofilms. Lancet 358:135. Whiteley, M., M. G. Bangera, R. E. Bumgarner, M. R. Parsek, G. M. Teitzel, S. Lory, E. P. Greenberg. 2001. Gene expression in Pseudomonas aeruginosa biofilms. Nature 413:860. Sauer, K., A. K. Camper, G. D. Ehrlich, J. W. Costerton, D. G. Davies. 2002. Pseudomonas aeruginosa displays multiple phenotypes during development. J. Bacteriol. 184:1140. Lu, X., F. Roe, A. Jesaitis, Z. Lewandowski, X. Liu. 1998. Resistance of biofilms to the catalase inhibitor 3-amino-1,2,4-triazole. Biotechnol. Bioeng. 20;59:156. Brown, S. M., M. L. Howell, M. L. Vasil, A. J. Anderson, D. J. Hassett. 1995. Cloning and characterization of the katB gene of Pseudomonas aeruginosa. J. Bacteriol. 177:6536. Hassett, D. J., H. P. Schweizer, D. E. Ohman. 1995. Pseudomonas aeruginosa sodA and sodB mutants defective in manganese- and iron-cofactored superoxide dismutase activity demonstrate the importance of the iron-cofactored form in aerobic metabolism. J. Bacteriol. 177:6330. Cochrane, C. G., R. G. Spragg, S. D. Revak. 1983. Pathogenesis of the adult respiratory distress syndrome. J. Clin. Invest. 71:754. Kirchner, K. K., J. S. Wagener, T. Z. Khan, S. C. Copenhaver, F. J. Accurso. 1996. Increased DNA levels in bronchoalveolar lavage fluid obtained from infants. Am. J. Respir. Crit. Care Med. 154:1426. Khan, T. Z., J. S. Wagener, T. Bost, J. Martinez, F. J. Accurso, D. W. Riches. 1995. Early pulmonary inflammation in infants with cystic fibrosis. Am. J. Respir. Crit. Care Med. 151:1075. Nivens, D. E., D. E. Ohman, J. Williams, M. J. Franklin. 2001. Role of alginate and its O acetylation in formation of Pseudomonas aeruginosa microcolonies and biofilms. J. Bacteriol. 183:1047. Henson, P. M., Z. G. Oades. 1973. Enhancement of immunologically induced granule exocytosis from neutrophils by cytochalasin B. J. Immunol. 110:290. Huang, C. T., K. D. Xu, G. A. McFeters, P. S. Stewart. 1998. Spatial patterns of alkaline phosphatase expression within bacterial. Appl. Environ. Microbiol. 64:1526. Bleazard, J. B.. The role of oxygen and the interaction of human neutrophils with viable planktonic and biofilm Pseudomonas aeruginosa. Master’s dissertation Montana State University, Bozeman, MT. Jorgensen, B., N. Revsbech. 1988. Microsensors. Methods Enzymol. 167:639. Villaverde, S., R. Mirpuri, Z. Lewandowski, W. L. Jones. 2001. Study of toluene degradation kinetics in a flat plate vapor phase bioreactor using oxygen microsensors. Water Sci. Technol. 36:77. Rasmussen, K., Z. Lewandowski. 1998. Microelectrode measurements of local mass transport rates in heterogeneous biofilms. Biotechnol. Bioeng. 59:302. Parkos, C. A., C. G. Cochrane, M. Schmitt, A. J. Jesaitis. 1985. Regulation of the oxidative response of human granulocytes to chemoattractants: no evidence for stimulated traffic of redox enzymes between endo and plasma membranes. J. Biol. Chem. 260:6541. Fishman, W. H.. 1955. Glucuronidases. Methods Enzymol. 1:262. Quinn, M. T., T. Evans, L. R. Loetterle, A. J. Jesaitis, G. M. Bokoch. 1993. Translocation of Rac correlates with NADPH oxidase activation: evidence for equimolar translocation of oxidase components. J. Biol. Chem. 268:20983. Heiple, J. M., S. D. Wright, N. S. Allen, S. C. Silverstein. 1990. Macrophages form circular zones of very close apposition to IgG-coated surfaces. Cell Motil. Cytoskeleton 15:260. Takemura, R., P. E. Stenberg, D. F. Bainton, Z. Werb. 1986. Rapid redistribution of clathrin onto macrophage plasma membranes in response to Fc receptor-ligand interaction during frustrated phagocytosis. J. Cell Biol. 102:55. Davis, G. H., R. J. Walter, C. B. Pearson, E. L. Becker, J. M. Oliver. 1982. Membrane activity and topography of f-Met-Leu-Phe treated polymorphonuclear leukocytes. Am. J. Pathol. 108:206. Goldstein, I. M., H. B. Kaplan, A. Radin, M. Frosch. 1976. Independent effects of IgG and complement upon human polymorphonuclear leukocyte function. J. Immunol. 117:1282. Zigmond, S. H.. 1977. Ability of polymorphonuclear leukocytes to orient in gradients of chemotactic factors. J. Cell Biol. 75:606. Jesaitis, A. J., R. A. Allen, C. A. Parkos. 1988. Activation of the neutrophil respiratory burst by chemoattractants: regulation of the N-formyl peptide receptor in the plasma membrane. J. Bioenerg. Biomembr. 20:679. Lewandowski, Z.. 1994. Dissolved oxygen gradients near microbially colonized surfaces. G. Geesey, and Z. Lewandowski, and H. Flemming, eds. Biofouling and Biocorrosion in Industrial Water Systems 175.-188. Lewis Publishers, Ann Arbor. MI. Hoffstein, S., R. S. Friedman, G. Weissmann. 1982. Degranulation, membrane addition, and shape change during chemotactic factor-induced aggregation of human neutrophils. J. Cell Biol. 95:234. Mukherjee, G., M. T. Quinn, J. G. Linner, A. J. Jesaitis. 1994. Remodeling of the plasma membrane after stimulation of neutrophils with f-Met-Leu-Phe and dihydrocytochalasin B: identification of membrane subdomains containing NADPH oxidase activity. J. Leukocyte Biol. 55:685. Singh, P. K., M. R. Parsek, E. P. Greenberg, M. J. Welsh. 2002. A component of innate immunity prevents bacterial biofilm development. Nature 417:552. Roy-Burman, A., R. H. Savel, S. Racine, B. L. Swanson, N. S. Revadigar, J. Fujimoto, T. Sawa, D. W. Frank, J. P. Wiener-Kronish. 2001. Type III protein secretion is associated with death in lower respiratory and systemic Pseudomonas aeruginosa infections. J. Infect. Dis. 183:1767. Krall, R., G. Schmidt, K. Aktories, J. T. Barbieri. 2000. Pseudomonas aeruginosa ExoT is a Rho GTPase-activating protein. Infect. Immun. 68:6066. Kazmierczak, B. I., T. S. Jou, K. Mostov, J. N. Engel. 2001. Rho GTPase activity modulates Pseudomonas aeruginosa internalization by epithelial cells. Cell Microbiol. 3:85. Pederson, K. J., A. J. Vallis, K. Aktories, D. W. Frank, J. T. Barbieri. 1999. The amino-terminal domain of Pseudomonas aeruginosa ExoS disrupts actin filaments via small-molecular-weight GTP-binding proteins. Mol. Microbiol. 32:393. Leid, J. G., M. E. Shirtliff, J. W. Costerton, A. P. Stoodley. 2002. Human leukocytes adhere to, penetrate, and respond to Staphylococcus aureus biofilms. Infect. Immun. 70:6339. Lee, S. R., K. S. Kwon, S. R. Kim, S. G. Rhee. 1998. Reversible inactivation of protein-tyrosine phosphatase 1B in A431 cells stimulated with epidermal growth factor. J. Biol. Chem. 273:15366. Lew, P. D., A. Monod, F. A. Waldvogel, B. Dewald, M. Baggiolini, T. Pozzan. 1986. Quantitative analysis of cytosolic free calcium dependency of exocytosis from three subcellular compartments in intact human neutrophils. J. Cell Biol. 102:2197. Bennett, R. M., T. Kokocinski. 1978. Lactoferrin content of peripheral blood cells. Br. J. Haematol. 39:509. Kjeldsen, L., O. W. Bjerrum, J. Askaa, N. Borregaard. 1992. 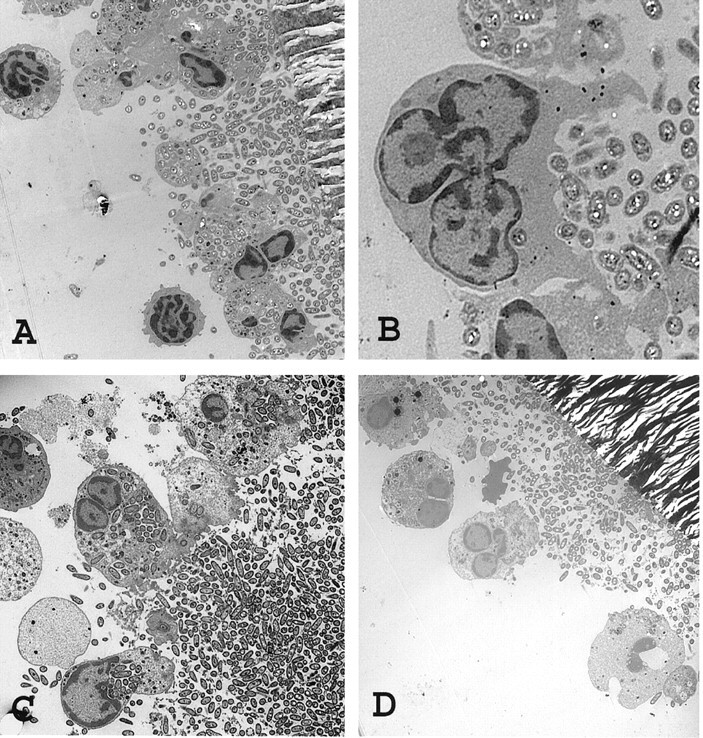 Subcellular localization and release of human neutrophil gelatinase, confirming the existence of separate gelatinase-containing granules. Biochem. J. 287:603. Britigan, B. E., M. B. Hayek, B. N. Doebbeling, R. B. Fick. 2003. Transferrin and lactoferrin undergo proteolytic cleavage in the Pseudomonas aeruginosa-infected lungs of patients with cystic fibrosis. Infect. Immun. 61:5049. Ohlsson, K., I. Olsson. 1977. The extracellular release of granulocyte collagenase and elastase during phagocytosis and inflammatory processes. Scand. J. Haematol. 19:145. Jensen, E. T., A. Kharazmi, K. Lam, J. W. Costerton, N. Hoiby. 1990. Human polymorphonuclear leukocyte response to Pseudomonas aeruginosa grown in biofilms. Infect. Immun. 58:2383. Test, S. T., S. J. Weiss. 1984. Quantitative and temporal characterization of the extracellular H2O2 pool generated by human neutrophils. J. Biol. Chem. 259:399. Britigan, B. E., H. R. Ratliffe, G. R. Buettner, G. M. Rosen. 1996. Binding of myeloperoxidase to bacteria: effect on hydroxyl radical formation and susceptibility to oxidant-mediated killing. Biochim. Biophys. Acta 1290:231. Britigan, B. E., M. S. Cohen. 1986. Effects of human serum on bacterial competition with neutrophils for molecular oxygen. Infect. Immun. 52:657. Roos, D., R. S. Weening, A. A. Voetman, M. L. J. Vanschaik, A. A. M. Bot, L. J. Meerhof, J. A. Loos. 1979. Protection of phagocytic leukocytes by endogenous glutathione: studies in a family with glutathione reductase deficiency. Blood 53:851. Bass, D. A., L. R. DeChatelet, R. F. Burk, P. Shirley, P. Szejda. 1977. Polymorphonuclear leukocyte bactericidal activity and oxidative metabolism during glutathione peroxidase deficiency. Infect. Immun. 18:78. Pietarinen-Runtti, P., E. Lakari, K. O. Raivio, V. L. Kinnula. 2000. Expression of antioxidant enzymes in human inflammatory cells. Am. J. Physiol. 278:C118.